If necessary, fold back the backrest of the third row of seats . If necessary, remove items of luggage so you can reach the tailgate from the inside. Remove the round cover from the interior trim on the tailgate. 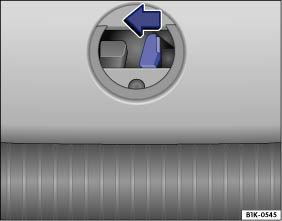 Push the release lever in the direction of the arrow and push the tailgate outwards until it swings open.